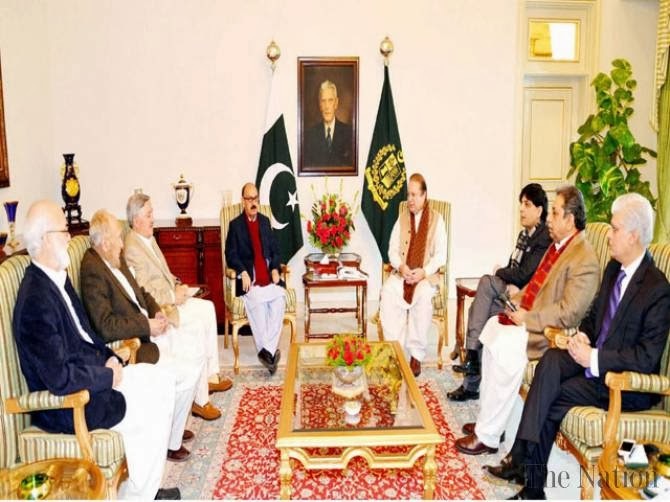 ISLAMABAD - Prime Minister Nawaz Sharif has given an open mandate to the four member peace committee, constituted for paving the way for negotiations with Tehrik-e-Taliban Pakistan (TTP), which met thrice on Friday. “We are seriously waiting for start of a meaningful and result-oriented dialogue” and are ready to meet the TTP representatives at any place, Adviser to Prime Minister on National Affairs Irfan Siddiqui told a press conference here on Friday. Siddiqui, who is also coordinator of the committee, said they were expecting the Taliban Shura would meet soon and announce a negotiation team for holding talks with the peace committee. “The Taliban should complete their consultation process at the earliest and form a negotiating team; this is our first message to them,” he said. The committee held its first formal 45 minute long meeting with the prime minister early Friday. The prime minister said he would be available for meeting the committee any time. He reportedly also gave the committee an open mandate and instructed it to initiate peace talks as soon as possible. Federal Interior Minister Chaudhry Nisar Ali Khan was also present during that meeting. Later, the committee held its second meeting at PM House and Nisar briefed the members on the previous efforts for talks with Taliban. The meeting then held its third meeting at the office of Irfan Siddiqui and took some decisions. Besides Siddiqui, the committee includes Major (r) Aamir, renowned journalist Rahimullah Yousafzai and Rustam Shah Mohmand, who is a former Ambassador to Afghanistan and expert on Afghanistan affairs. Adviser to PM Irfan Siddiqui told reporters that the committee would now look for a response from Taliban and was ready to meet their representatives at any place which is decided. “We do not want to waste time and want to listen to the Taliban’s stance and have them listen to ours.” Siddiqui said the committee is enjoying confidence of all parties in the parliament, media and all segments of the public opinion. Taliban have also so far not objected over the committee or its members, he noted. To a question, he said he was expecting that the committee’s work will span over weeks and months and it would not take years. Expressing optimism about the prospects of talks, he said outcome of talks will rest on what the Taliban say and what is their agenda. He said the talks with Taliban would not be based on any conditions, however, members of the committee understood what the prime minister and his government members, and parties had been saying. In a written statement, the committee also asked both the government and the Taliban not to make any statement that could vitiate atmosphere for the dialogue. Siddiqui said the committee members sincerely want that there should be no delay in initiating the dialogue. He said the committee is waiting for a response from Taliban for a mechanism to proceed further. Irfan Siddiqui said the committee has decided that whenever it will feel the need it will seek help of influential people from different walks of life in an effort to make the negotiation process successful. He said the Khyber Pakhtunkhwa government was fully onboard on the issue of formation of committee and Rustam Shah Mohmand had been nominated by it as its representative. He told that KPK governor also talked to him on phone and assured of his full cooperation to the committee. Online adds from Peshawar: The banned Tehreek-e-Taliban Pakistan’s shura will meet today with their Vice Ameer Shaekh Khalid Haqqani in the chair. TTP's commander told a private news channel that the meeting would constitute a committee for holding dialogues with the government. He revealed that the committee would be headed by political shura Ameer Qari Shakeel. He said that the shura might demand for the inclusion of Jamaat-e-Islami Chief Munawwar Hassan or Khyber Pakhtunkhwah Finance Minister Sirajul Haq in the four-member committee formed by the government.